Rahmbo, First Blood: No President Can Stop Him! Whenever presidents appear politically vulnerable, as reflected in declining approval ratings, a failure to pass major policy initiatives, or in anticipation of a major electoral defeat, supporters – not wanting to attack the President directly – begin to look for suitable scapegoats. Typically that means targeting seniors members of the President’s White House staff, in the belief that their bad advice is responsible for the President’s weakened state. We have seen this dynamic before, of course. Early in the Clinton presidency, after the health care debacle and a series of other missteps (the near failure to pass a budget, gays in the military, the haircut that allegedly closed LA X airport), Clinton – his poll numbers sagging – revamped his White House staff by bringing in experienced Washington hands – David Gergen, Leon Panetta – who could “get things done in Washington and the world.” They helped stop the bleeding, made the trains run on time and are generally credited with stabilizing his administration. But this most recent version of this media game has an interesting twist. Although Gelb clearly takes aim at almost the entire upper echelon of Obama’s White House staff – particularly the “campaign crowd” – the reaction among the Washington punditry has centered on his advice that Obama fire his chief of staff Rahm Emanuel. This is not surprising – the progressive win of the Democratic Party, particularly the netroots who served as Obama’s shock troops during the campaign, have never been happy with Emanuel. They view him as a closet Clintonite and political insider who is far too willing to sacrifice progressive ideals – the public option, closing Guantanamo, ending trials by military commissions – as a necessary price to close deals with moderates. Because Gelb, a longtime Washington foreign policy hand, is not normally associated with this progressive wing, his article provided the ideal cover to renew the attack by the netroots on Emanuel. In so doing, however, progressives have run into an obstacle. Emanuel – a veteran of the Clinton White House and a former member of Congress – is an incredibly skilled infighter with strong media connections and, unlike Clinton’s chief of staff Mack McLarty, he is not going to go quietly. Within days of Gelb’s column, Emanuel – or someone close to him – struck back via an extraordinary Dana Milbank column in the Washington Post that essentially laid all the blame for Obama’s failures to date on the President’s failure to listen to Emanuel! The sheer audacity of this strategy – blaming the President to save one’s job! – led many to immediately dismiss Emanuel as the source of the story. (Milbank denied that he had talked to Emanuel). I happen to disagree – I think this is precisely what Rahmbo would do. 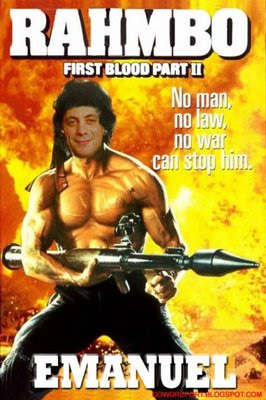 Remember First Blood? Sly Stallone – Rambo, the ex Vietnam/Clinton veteran – is walked across the bridge by local police officers/Obama’s campaign team and told to leave town/resign. What does he do? He reverses course and goes on a one-man rampage, annihilating the inexperienced law enforcement officers/campaign team who have no idea what they are getting into when they provoked him/leaked to Gelb in the first place. Only his former commander/Bill Clinton understands, but he is ignored. Really. You can’t make this up. Art predicting life. I can’t wait for the sequel. Emanuel’s attack on the President is, in my view, classic Rahmbo: direct and very effective, primarily because the case he makes on his behalf (or that someone makes on his behalf) is hard to refute. In several high profile instances, from Guantanamo to military commissions to where to try Khalid Sheikh Mohammed, Obama has ended up backing away from his original choices in favor of Emanuel’s preferences. It appears that pattern will repeat itself with health care, with the final outcome coming very close to Emanuel’s original negotiating end point. It is easy to dismiss this leaking and counterleaking as so much petty nonsense, the product of massive Washington egos engaged in a media food fight. In fact, this is a crucial exchange that is liable to have important consequences for the Obama presidency. It is important to realize that members of the White House staff have no independent base of power (unlike, say, cabinet members); all their influence derives directly from perceptions regarding how close they are to the President. How often do they see him, and does he take their advice? Emanuel understands only too well that if the prevailing impression in Washington becomes one that views him as losing access to the President, his influence – and therefore his ability to shape policy and run the White House – is over. That’s why I believe Rahmbo struck back so forcefully, and in such a visible manner. His ultimate target was not simply the media – it was the President. Sometimes it’s easier for a senior staff member to say something the President must hear through the media than it is to tell him directly. It will be interesting in the next several weeks to see if Obama signals his support for Emanuel through a well-placed public remark, photo op or other signaling device. This tells me that if anyone resigns in the run-up to next fall’s midterms, it will be one of Obama’s campaign aides – Robert Gibbs, Valerie Jarrett, David Axelrod – and not Emanuel. All presidents and their senior campaign aides take office overestimating their capacity to initiate change. They soon learn just how weak the presidency is. Change, if it occurs at all, takes place in very tiny increments. Emanuel, a Washington veteran with previous White House experience, understood this from day one in a way that Obama and his campaign loyalists have only gradually come to realize. If he is smart, Obama will retain Emanuel. This is not to say that Emanuel will serve out the entire first term. But a look at the history of previous chief of staffs suggests his expiration date will probably come after the midterms. As evidence, in my next post I’ll provide some data on the tenure of previous chief of staffs. You can see why no man, no law, no war – and likely no President – can stop him. All the more interesting that this bit of unsolicited counsel came from Les Gelb, as by personal inclination, he’s not much given to aligning himself with the progressive wing of the party. That’s one reason why this piece had legs. Since the first shot was fired by someone outside the White House, is it clear that the President will even need to jettison anyone? Recall that his original vision for GTMO and for reversing torture policies was to close the book on the past and move forward. I’ll wager that he handles this kerfuffle the same way, and that it’ll be a while before resignations are called for. This President is known for accepting criticism gracefully, and for his insistence that the focus remain not on Beltway politics-as-usual, but where it needs to be — on the issues. I believe his first move will be to voice his opinion that White House spats are just as irrelevant as squabbles on the Hill. Of course, it’s best to keep the staff on board until they strike out — as in, 3 strikes and you’re out. Further, the President appreciates the “team of rivals” approach. It’s the resignation itself that really loosens tongues. Of course, if it’s All in the Family that the President is looking for, then Rahm Emanuel is certainly the White House’s Archie Bunker, being of no disposition to take his own favorite advice to “Stifle yerself!” If he turns out to be a loudmouth, or, like Kanye West, makes himself “a jackass,” he’ll be the first to be dumped. Matt, since you have read more White House tell-alls than the average observer, can you suggest how, in practice, this kind of staff infighting is aired before a President? Someone will have to show him Milbank’s column, and in this case, it won’t be the chief of staff. Press Secretary Gibbs, then?